Barton Rovers’ last game of a tough season saw them defeated 5-0 at promotion-chasing Hayes & Yeading on Saturday. A depleted squad to injuries and an end of season fixture pile up, which saw Barton lose 2-1 at home to Moneyfields United on Thursdy night, forced manager Tony Fontenelle to name himself as a substitute. It wasn’t long before Matt Finlay in the Rovers goal had to be on his toes to snuff out a Duncan Culley advance. Rovers were making hard work of things with moves littered with sloppy, tired passes that gave the initiative away cheaply, putting them under more pressure. Culley got another shot away that stung Finlay’s hands, but Barton had chances of their own, Drew Phillips’ effort parried away and Dan Jarvis seeing his attempt turned behind. That was to be Rovers best and maybe only golden spell of the game as Hayes took full control of proceedings. Laste Dombaxe found ample space in Barton’s 18-yard box and an effort in via the far post on 20 minutes, while just before half time, Culley made amends for his earlier miss by slotting home to make it 2-0. It was more of the same in the second half as Hayes went all out to increase their goal difference and have a chance at automatic promotion if they lost in the play-off final. 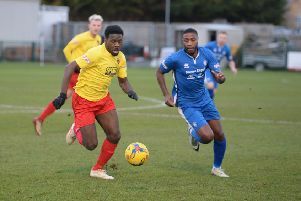 They went about that task with vigour and fight, a brace from Spyros Mentis making it 4-0 and a final goal on 88 minutes by Manny Duku piling on Rovers misery. Rovers manager Fontenelle said: “That was just one game too far for the whole squad after the fixtures we have played in the last 14 days. “We were down to bare bones and it has been a long trying season for all the boys but we showed character not to just totally roll over. “Credit to Hayes, they fought for everything and wanted as bigger win as they could get, so good luck to them in the play-offs. “For us its now back to the drawing board, a quick sit down with some of the lads who we want to retain for next season then the process of assembling a squad to push on.